﻿ Amish Salzburg Shaker TV Stand 72"
Amish Salzburg Shaker TV Stand 72"
This beautiful Amish TV Cabinet is proudly handcrafted in Indiana. 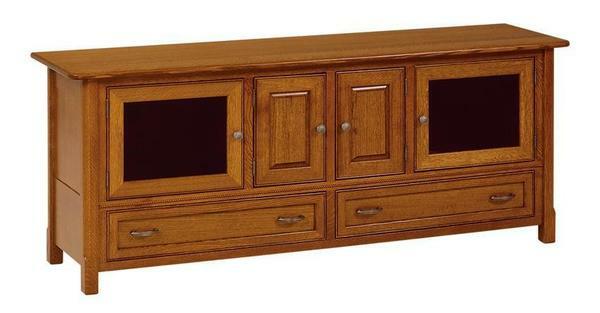 This American made entertainment center is made from oak wood, cherry wood, rustic cherry wood, quarter sawn white oak wood and brown maple wood. Custom woods are available upon request as well for this Amish TV Stand. On all drawers you will have brown maple sides and walnut fronts and backs are used as well as dovetailing. (Item 12242) Amish Salzburg Shaker TV Stand 72"